This Technology is applicable to all machines old or new because it has an advantage of utilizing the maximum shank length available of the tool therefore the number of depth cuts are greatly reduced. 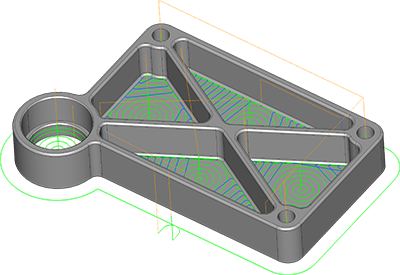 It offers unique machining and linking strategies for generating 3D high speed toolpaths. It smooths the tool paths of both cutting moves and retracts and high feed moves, wherever possible, to maintain a continuous machine tool motion which is an essential requirement for maintaining higher feed rates and assisting to eliminate dwell of the machine. There are many advantages in saving tooling costs due to using the full cutting ability of the tool flank rather than just the bottom of the tool. No fancy names, no added costs just good solid machining technology. HS Machining High Efficiency Technology was first introduced in 2007 and has continually been refined since. OneCNC was an early pioneer into this efficient style of machining and it is included as a standard function in all milling systems for the 2D and in the Professional and Expert versions for the 3D machining. As a major machining time saver this no extra cost function has been saving users 70% or more machining time ever since. No fancy names no added costs just the best technology in the industry. OneCNC seamlessly integrates 4 and 5 axis simultaneous machining within its milling providing a range of multi-axis cutting strategies that can be applied to the most complex components. Intuitive, easy-to-use wizard graphical user interface. Ideal for the rotary machining of automotive and aerospace components. Modules include machining simulation to aid verification of the machining process. Swarf cutting for machining of variable taper walls. 5 axis finishing across multiple surfaces..
Full support for all common tool profiles, including lollipop cutters. Easy-to-use machining strategies are designed to maximize productivity and quality. 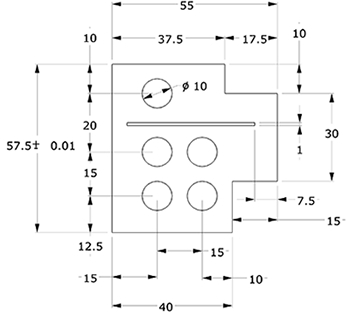 OneCNC 2D machining ranges from the very simple to the very complex. OneCNC delivers all the tools you need for precise control over all aspects of 2D machining. OneCNC provides separate lead-in and lead-out for profiles and pocket finish passes. Functionality includes ability for multiple roughing and finishing passes and or multiple depth cuts for any contour. 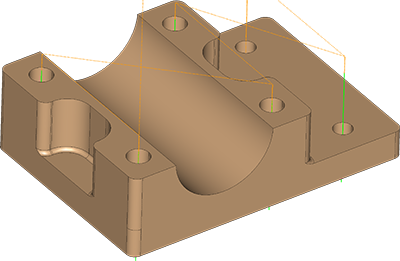 Profile is made easy to machine 2D and 3D contours including all geometry and NURBS splines. Drilling is feature recognition driven system whereby the holes to be drilled are automatically recognised and listed for template production. Choose between OneCNC machining cycles and your machine tool canned cycles. Complex holes that require multiple cycles and tools can be in a single step with OneCNC templates. Using the manager, in one step you can spot drill with chamfer, through drill, counter bore, and ream a set of holes. Thread milling can be one of the functions of machining that can be very time consuming. OneCNC takes a very practical approach to this ability providing wizard based control to remove the complexities of this functionality. Tapered or straight internal or external thread milling is automated for single or multi tipped tools. Threads can be directly selected from a comprehensive thread library or custom threads can also be very easily added to the thread library. OneCNC High Speed pocket milling creates an active tool path that delivers more consistent cutting conditions and allows use of the entire tool flute length reducing machining time. OneCNC pocketing function provides full tool control and extensive automation for roughing and finishing pockets. OneCNC can dramatically simplify your programming whether you are machining straight-forward shapes or complex pockets with irregular boundaries, multi-level islands, and multiple bosses and sub-pockets. The extensive ability of pocket machining and finishing provided by OneCNC gives the options for your pocket milling needs. Automated rest machining of the uncut areas of your pocket ensures maximum efficiency. OneCNC monitors the material left over from previous machining operations and uses the information to automatically perform any number of roughing and finishing cycles to complete the pockets. 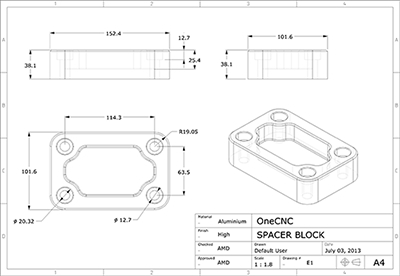 OneCNC has all the features required to engrave part numbers or scan logo graphics for engraving. 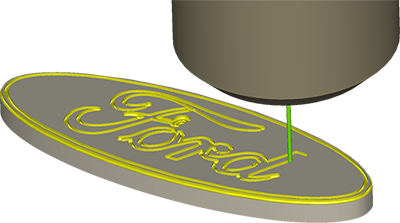 This engraving can be projected on to 3D models for 3 axis machining or in the case of multi axis modules can be machined either 4 or 5 axis as well. 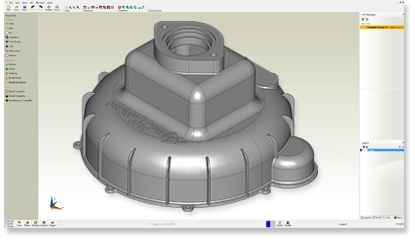 OneCNC has the ability to create or import a solid or surface model. This model can then be directly machined with the various functions provided to completely machine the part. Clamps and other objects can also be modelled and included and these can be ignored in the machining tool path operation. OneCNC Mill Expert includes a very extensive set of tool path tools to enable toolmakers and mould maker’s machine and finish all the parts to the high standard required. OneCNC Z level machining, which includes step reduction technology and automated re-machining of the uncut areas of your part for maximized part quality and minimized finish work with OneCNC rest-material re-machining cycle. OneCNC monitors the material left over from previous roughing operations and uses the information to automatically perform any number of roughing and finishing cycles. Then you can choose from pencil tracing, planer cutting, radial, and spiral tool-motion and custom patterns to complete the part. OneCNC 4 or 5 axis modules add 4 or 5-axis Positional and Simultaneous machining capability to OneCNC milling cycles. Programmers can use multiple fixture offset with global work coordinates to machine any part face, using any OneCNC machining cycle. OneCNC 4 or 5-axis indexing supports any combination of rotary tables to orient the part, then machines with 2 1/2 and 3-axis operations using one or more OneCNC functions. OneCNC wrap milling is performed directly from the flat 2D features or the model surface laid flat. OneCNC readily programs rotary profiling, pocketing and drilling utilizing a simultaneous 4th axis. OneCNC converts one of the flat movements (X, Y, or Z) into a rotary C-axis movement, wrapping the profile around a rotary axis. Multi-axis machining can dramatically increase a shop’s competitiveness. OneCNC multi-axis added modules offer a wide range of multi-axis machining strategies both basic and advanced all with wizard driven control for simplicity of use. Even Swarf machining is so automated that surfaces can be selected without the need of control rails or constructed geometry. 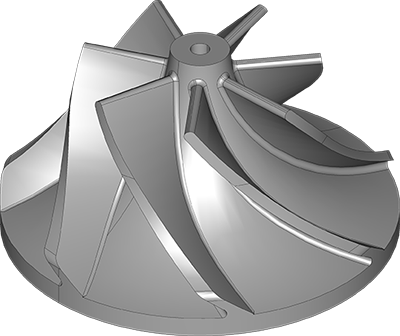 With programming and full simulation from either stock or a stock model the power of 5axis is revealed to the user. With OneCNC, you have complete visual control for checking and viewing of tool paths in a clear and precise way. OneCNC accurate and reliable dynamic solid verification eliminates the need for expensive dry runs on the NC machine. Gain complete confidence in your machining process as you compare accurately machined compared to the original parts. 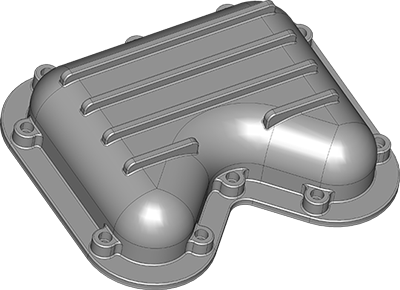 High-performance, real-time simulation ensures that even the most complex of parts will be machined correctly. OneCNC can give you verification ability of the part program simulated within a complete machine tool, fixtures, clamps, stock, and part. Minimize downtime, maximize manufacturing efficiency, and cut machining costs while gaining complete confidence in your machining processes with OneCNC. HS 2.5 D Machining High Efficiency Technology was first introduced in 2007 and has continually been refined since. As a major machining time saver this no extra cost function has been saving users up to 70% or more machining time ever since. No fancy names no added costs just the best technology in the industry as proven over the past 6 years. 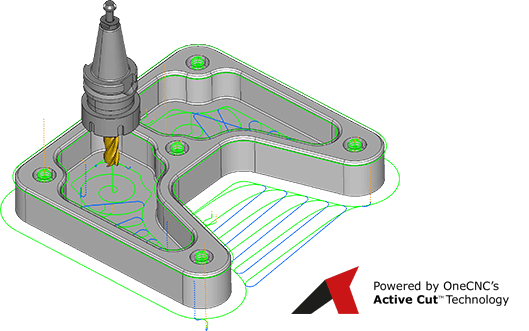 3 axis re-position machining functionality allows for creating NC programs for parts that are to be machined from multiple sides or positions. These programs can be all contained in the one program or as separate sub programs. All the functions of machining can be used on all positions including 2.5D High Speed Machining or the 3D High speed machining. This feature can be a great time saver by using multiple vices or fixtures to position the parts with different machine work offset positions. This Video shows how the solid simulation works where the user can see the whole part machined from the various positions. The rotation is also simulated showing the solid simulation of the completed part. OneCNC CAD/CAM Mill Expert is a complete standalone design and manufacturing solution. This is the most capable version of OneCNC CAD/CAM to Design and model engineering components for CNC manufacture all in one easy-to-use program. Whatever your starting point from an idea concept, design sketch, customer data, scanned image OneCNC CAD/CAM Mill Expert will help you make it possible. All of these tools are incorporated in one stand alone solution. No other software is required to complete your task. 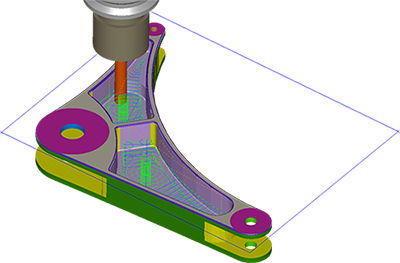 OneCNC CAD/CAM has a unique combination of geometry construction and hybrid-modelling tools let you create detailed, accurate 3D models from simple to the most complex mechanical parts simply and efficiently. 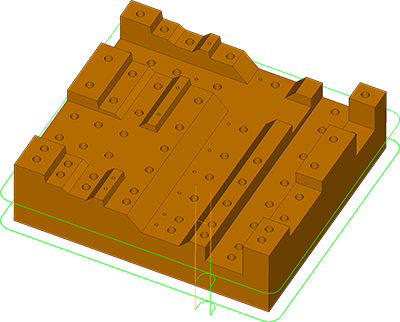 Complete solution combining power of toolpath generation with seamless CAD in one totally integrated CNC program and manufacturing simulation solution. Designed for the CNC tool making environment with functionality to maximise metal removal rates, and finishing toolpaths providing high quality finishes. Provides efficient toolpaths that maintain consistent cutter load, increasing tool life with emphasis on tool paths for each purpose in 3 axis as well as multi axis. High Speed toolpaths that minimise sudden changes in cutting direction, preventing tool breakage and part damage. Tool paths that produce parts with excellent surface finish quality, eliminating hand finishing. Machining ability up to 5 axis simultaneous with added modules providing an extensive range of machining capabilities. Here is a simple list containing many of the features that the various OneCNC Mill products provide.